Definition at line 18 of file AsyncCbdataCalls.h. Definition at line 21 of file AsyncCbdataCalls.h. Definition at line 23 of file AsyncCbdataCalls.h. Definition at line 28 of file AsyncCbdataCalls.h. References UnaryCbdataDialer< Argument1 >::arg1, and CbcPointer< Cbc >::valid(). Definition at line 29 of file AsyncCbdataCalls.h. References UnaryCbdataDialer< Argument1 >::arg1, CbcPointer< Cbc >::get(), and UnaryCbdataDialer< Argument1 >::handler. Definition at line 30 of file AsyncCbdataCalls.h. Definition at line 33 of file AsyncCbdataCalls.h. 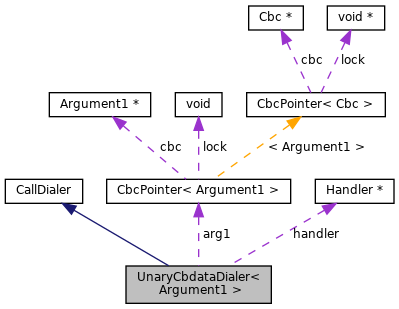 Referenced by UnaryCbdataDialer< Argument1 >::canDial(), cbdataDialer(), UnaryCbdataDialer< Argument1 >::dial(), and UnaryCbdataDialer< Argument1 >::print(). Definition at line 34 of file AsyncCbdataCalls.h. Referenced by cbdataDialer(), and UnaryCbdataDialer< Argument1 >::dial().